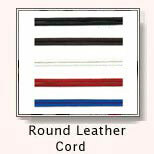 PS Daima and Sons are Indian manufacturer, supplier and exporter of a wider range of leather cords. 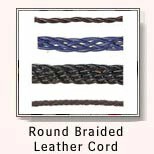 Different kinds of leather are used to make a wide range of leather cords. 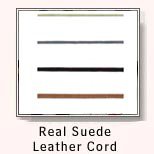 Variety of colorful laces & tapes made out of fine quality of leather are used to adorn leather jackets, hunting or hiking boots, chaps, leggings, choker, bracelet ends, caps, stretch cotton suits to give these a special touch. Apart from laces, various other leather items are also manufactured such as leather fabrics, beads, belt blanks, buckles, toggles, braids, buttons, ribbons, fringes, flowers, jewellery and mobile covers. Catering to a wide export clientele, PS Daima takes pride in admitting that not a single meter of the leather lacing supplied by it, has ever been rejected. For us Customer's Delight is our priority and this journey of 28 years is the testimony of our dedication, market, customer requirements and success. Buyers can specify their customized requirements so that we can accordingly produce the required type of leather lace. We offer different types of packagings for leather cords such as plastic reel, ball, polybag, hanks in polybag, e-card and many more. 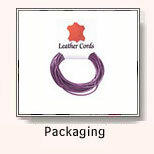 These packagings vary in sizes and load taking capacity depending on the length & size of leather cords. Perfectly cut leather shaped in rounded form. Round leather lacing is a strong lace. We use many imported machines and chemicals for producing high quality lace. 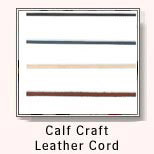 This high quality leather is given extra fine finishing to produce quality lacings. Available in black, voilet,brown color. This high quality Italian leather is given extra fine finishing to produce quality lacing. 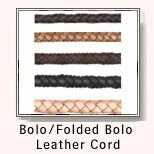 Each bolo lace is machine finished, buff polished and made in different thicknesses. We use Italian braiding machines for giving consistent quality and excellent value . These are ideal for watch bands, ladies' bolos and necklaces. Only the very best natural leather is selected for these premium lacing. European Machines are used for making Rounded Braided Lacing. Available in shades of brown & black. Good quality leather, tanned from the best portion of the cowhide - known as 'bends' is used to make this lace.These hides average 8 to 10 square feet and are about 4 to 4.5 oz in thickness (about one sixteenth of an inch). Their mellow temper, makes them perfect for lacing. Calf leather is thick having minimum stretch, tensile strength, and maximum durability. We craft half round and then finish by wax. Available in different colors. 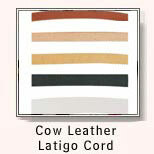 Cow leather is sturdy and rugged, yet never coarse or rough. 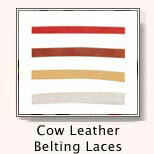 We selects only the finest cow skins and treat them carefully so that the leather's natural beauty is retained. We can use these laces as or in belt. The cow leather we use is called "Latigo" which is leather selected by the tannery to provide great strength and excellent wearability. 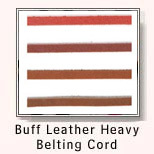 These are same types of leathers used to make harnesses. We can also use these laces for shoes. 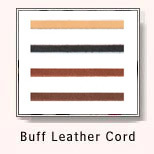 Buff is the stout velvety dull-yellow buffalo leather which is used to make belts. 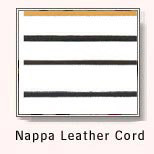 These durable belts are available in basic colors-black, brown and dark brown..
Nappa is a soft, full grain leather made from an unsplit sheepskin or lambskin. It is usually tanned with alum and chromium salts and dyed throughout in different shades. Nappa is softer than others. It is sewn to make delicate laces. 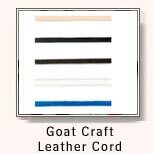 Goat Leather Cords are highly in demand for craft projects. 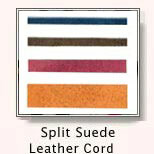 We make durable laces made from goat leather tanned in various shades.